PlatinumOne, the one copy of Whispersilk Cloak does cut it. Rishkar's Expertise , Soul's Majesty , and Garruk, Primal Hunter draw your deck on a storm turn. Other than that, everything you said is true. That's why I made this post. I'm looking for cuts to run Savage Summoning and Blossoming Defense ; those seem like good ways to deal with interaction. I might put Lignify in the sideboard, too. Point is, yeah, the deck folds to any sort of control and I'm looking to fix that. lagotripha, you're suggesting some drastic changes to the deck and the fundamental way it functions. I like what you're saying, and I honestly think I'm just going to go ahead and make a completely new list on tappedout following your suggestions. We'll see what happens with it, thanks. Unlife, use Garruk, Primal Hunter , Rishkar's Expertise and Soul's Majesty to draw until you find Whispersilk Cloak . Swing with a cloaked and hella swole elf. Flooremoji, there's only one creature we're trying to untap and that's the Marwyn/Joiner on the field. Synchronized Strike is good if you have two of them on the field, but that doesn't offset the increased cost. And, you're right, I need more mana. Currently trying to find cuts for it, thanks for pointing that out. DruneGrey, this was previously a private list that ran Visionary. I found two mana wasn't worth a Marwyn pump without an untap, even if it doesn't cost a card. I think Visionary might be more at home in what lagotripha's suggesting. Hey there!!! Fellow Kamahl player here, you have a great start so far. I have some suggestions that can help beef up the deck. 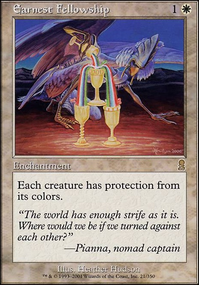 Nacatl War-Pride - This creature pairs really well with kamahl, especially if you have Nykthos, Shrine to Nyx or a transformed Growing Rites of Itlimoc Flip out. Regal Force - big draw engine and another body for kamahl to beef up. 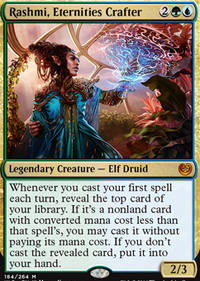 Selvala, Heart of the Wilds - if you can afford her, pick one up. She generates so much mana it isn't funny. Selvala's Stampede - This card if you predominantly play group games, as you get a free creature from your library or free permanent for each player, no matter how they vote. 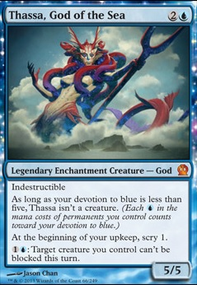 Rishkar's Expertise - a big draw engine that lets you cast a free card. Lurking Predators - This card is amazing, especially in big group games. Garruk, Primal Hunter - Great token generator and draw engine. Hall of Gemstone - shuts down multi colored decks, and locks nongreen decks out of your turn so you can overrun without worry. Those are just a few suggestions for you, here's a link to my kamahl deck for more ideas if you need them - Om nom Trample. sub780lime, personally I don’t care much for cards like Llanowar Elves and Elvish Mystic . Selvala, Heart of the Wilds could definitely replace one of those. But if you want a cool combo with that, keep one of those two to pair with Selvala for her ability, and with your Paradox Engine , you could cast a lot of spells and probably have a decent amount of mana left over, which you can always use on the Ant Queen . 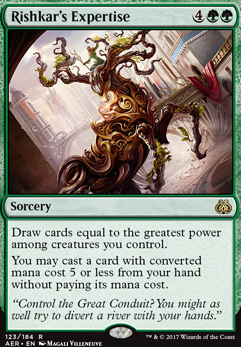 Undergrowth Champion is a good card, but it seems kind of extra here. Same for Nevinyrral's Disk and Sensei's Divining Top . I’d add a Crucible of Worlds in its place. Also, I think you have enough land search that you don’t necessarily need lands like Misty Rainforest . And as someone else stated, Rishkar's Expertise would also be here. But it’s ultimately your call, this is just what I’d do. DrkNinja, thanks for the feedback. Your list is pretty much made up cards that were on my maybe list, but for which I didn't end up finding a place. Lightning Greaves is in the list already. I agree on the mana doubling. I plan to dump one of them, if not both. I did have a a question for you - from the list you posted, how would you prioritize the cards. I think I need a spot for Rishkar's Expertise . It's at the top of my list for adds. The others, I am not so sure. I moved away from land plays from the graveyard. I kept a couple ways to do it, but since I didn't necessarily need the mechanic to accomplish anything specific and Multani doesn't care of they are there, I pulled Crucible of Worlds and didn't see enough value in Titania, Protector of Argoth , but I am curious if there is more of a case for land recursion enough to dedicate more spots too it. 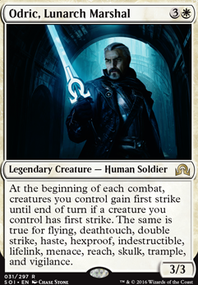 I want to start by saying that I don't like Vernal Bloom, or Mana reflection. They are great cards but in a mono-green lands matter deck, LANDS matter not so much mana. You have a few mana sinks but none of them win you the game (well except maybe Genesis Wave ). Second I don't know what Powder keg is there for but it's not very good in my opinion, there are a LOT of green cards that kill artifacts, and creatures don't matter because Multani just tramples over them. 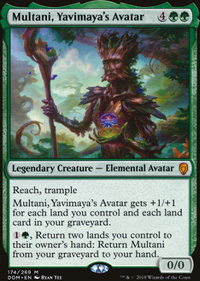 I helped my wife build a Multani deck, I am Groot!, my best friend an Omnath deck, my own omnath deck, and then my jund omnath deck AKA Lord Windgrace And here... we... go... so I think I have some experience with green lands lol. Here's a list of cards I suggest!